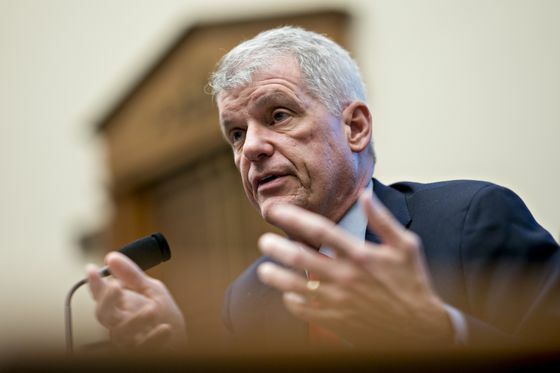 (Bloomberg) -- For the past 30 months, the investor case for keeping Wells Fargo & Co. veteran Tim Sloan as chief executive officer was his steady hand. His abrupt departure last week is bringing more turmoil instead. 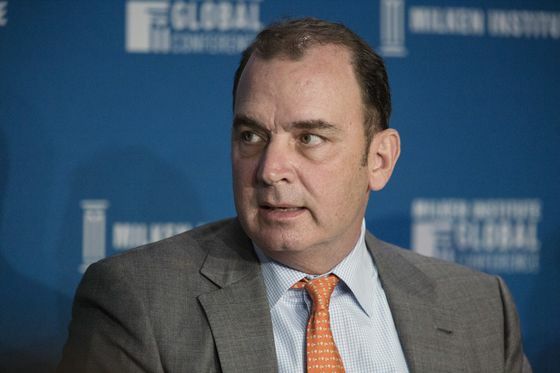 The bank, already under fire from regulators and lawmakers, is again caught flat-footed as it starts what could be a lengthy search for a new CEO. No formal talks with possible successors have begun and a recruiting firm had yet to be selected as of late Tuesday, a person familiar with the matter said. The San Francisco-based bank declined to comment on the process. One tally of supposed candidates lists more than two dozen men and women. Many investors aren’t waiting for the answers. 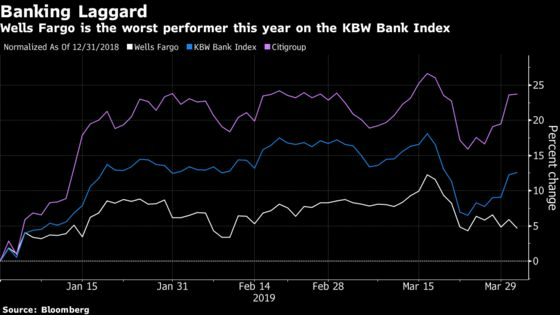 Wells Fargo is the worst performer among the biggest U.S. banks since Sloan’s departure, dropping 1.8 percent, compared with an increase of 3.3 percent for the KBW Bank Index. It’s also posted the industry’s smallest gain for the year. KBW analyst Brian Kleinhanzl, who had the equivalent of a buy rating on the stock, downgraded the bank after Sloan’s announcement, and S&P Global Ratings cited “increased uncertainty” in cutting its outlook to negative from stable. Chief Financial Officer John Shrewsberry has backtracked on guidance for financial targets through 2020, saying that expenses beyond this year are subject to the new CEO’s vision, whenever he or she arrives. That calls into doubt the bank’s ability to meet an ambitious cost-cutting plan it’s been using to offset muted revenue growth. The next leader’s job description is daunting. More than a dozen investigations span the bank’s various business lines. In one example, agencies are probing improper altering of customer documents in the wholesale unit -- which Sloan ran from 2014 to 2016. A person familiar with the matter said the bank knew about the problem in 2017, but didn’t tell regulators until after the Federal Reserve imposed growth restrictions on the bank in February 2018. The next CEO may also inherit 14 outstanding consent orders, business restrictions related to Wells Fargo’s “needs to improve” rating under the Community Reinvestment Act, and heightened legal expenses tied to the myriad scandals. Added to the list in February was the potential for additional regulatory scrutiny of the bank’s technology operations, following a days-long system outage. Among the regulators running those probes is the Office of the Comptroller of the Currency, whose mission is to ensure that banks “operate in a safe and sound manner.” Now, one of the largest banks under its purview has an interim leader, Allen Parker, who was general counsel, and it’s barely into the first phase of the CEO search. From the start, Sloan’s appointment to the top job after John Stumpf’s ouster drew criticism. Sloan had risen through the ranks over a three-decade career at Wells Fargo, and the bank faced internal and external investigations into millions of potentially fake accounts employees created to meet sales targets. Critics including Senator Elizabeth Warren, a Massachusetts Democrat, had argued the company needed someone uncorrupted by the corporate culture that had allowed the scandals to develop. Those criticisms never faded. Lawmakers summoned Sloan to Washington more than two years later, on March 12, for a hearing before the House Financial Services Committee. Democrats and Republicans took turns grilling the CEO for more than four hours, with several expressing doubts that the long-time insider should be running the firm. Things got worse as the hearing ended: The OCC issued a rare public rebuke of Wells Fargo’s progress. The next day, Sloan met with senior OCC officials, according to two people familiar with the meeting. The conversation was tense, one of the people said. 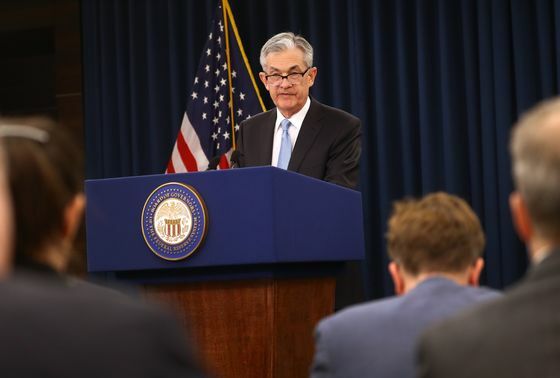 Piling on a week later was Fed Chairman Jerome Powell, who again said publicly that the central bank wouldn’t lift its cap on Wells Fargo’s growth until the lender’s problems were addressed. Wells Fargo’s breakdowns have “gone on and on,” Powell said at a news conference on March 20. Eight days after Powell’s remarks, Sloan stepped down as CEO, president and board member, effective immediately. Still, his departure hasn’t stopped the drumbeat of criticism. Warren on Tuesday said in a Washington Post op-ed that she would introduce a new bill expanding criminal liability for corporate executives who oversee wrongdoing. Wells Fargo was her lead example.